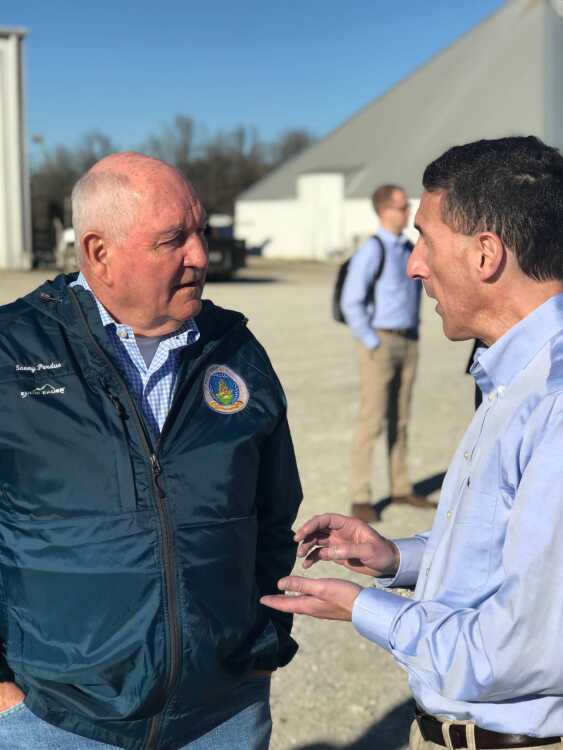 Rep. Kustoff with USDA Secretary Sonny Perdue. West Tennessee is fortunate to have some of the best farmland in the country. So, it is no surprise that President Trump’s Agriculture Secretary, Sonny Perdue, visited earlier this month to see for himself. Secretary Perdue is a farmer and former Governor from the state of Georgia, and he knows the unique challenges our producers face in this region. On March 2, I had the great privilege of welcoming Secretary Perdue to West Tennessee. We began the day at the Mid-South Farm & Gin Show, a tradition that brings together thousands of farmers from across the region. While touring the show, Secretary Perdue announced the renewal of the Cotton Ginning Cost Share program, which will assist farmers devastated in recent years by falling commodity prices and unfair subsidies by countries like China. After touring the exhibit floor, Secretary Perdue joined me in Brownsville for lunch and a town hall discussion with more than 150 members of the Tennessee Farm Bureau. It is not every day that a member of President Trump’s cabinet visits the Eighth District, so I took full advantage of the opportunity to show off our beautiful countryside and the great people who call it home. We have more than 10,000 farming operations in the Eighth District, and they are run by some of the most hard-working and dedicated Americans you can find. Our farmers are true salt of the Earth people, with deep-rooted family traditions that have helped preserve our strong agriculture industry. However, in recent years, farmers and ranchers across the country have faced real challenges. Net farm income is estimated to have fallen 56 percent from 2013 to 2016 – the steepest percentage drop since the Great Depression. Much of this is due to our increasingly competitive and often unfair global market. But farmers in West Tennessee are resilient, and many of their operations go back two, three or even four generations. They have experienced change and know that it brings a chance to evolve and prosper. Now, our region has an opportunity to establish itself as the innovation hub of agriculture and food production. Today, technological improvements are giving American farmers a real competitive advantage. From GPS-enabled tractors to advanced crop sensors, modernized equipment is helping our farming operations overcome the obstacles that have surfaced over the last decade. New seed technologies, along with advancements in pesticide management, spot treating fields and the use of drone technology, are quickly becoming the new normal in agriculture. As we look toward the future, the world will need American farmers to produce higher yields within increasingly tight margins. That is why we must continue to eliminate government overreach. After all, farmers know better than Washington bureaucrats how to get the job done. Finally, we are working on the 2018 Farm Bill, and I committed to getting it right and finished on time. As I work with the Trump Administration and my colleagues on this major legislation, I will make sure that West Tennessee producers are at the forefront of every discussion. Rural America elected Donald Trump to look out for our farmers and ranchers, and the president is keeping his promises. I have said it before, and I will say it again: agriculture is the lifeblood of America, and West Tennessee is the heartland.